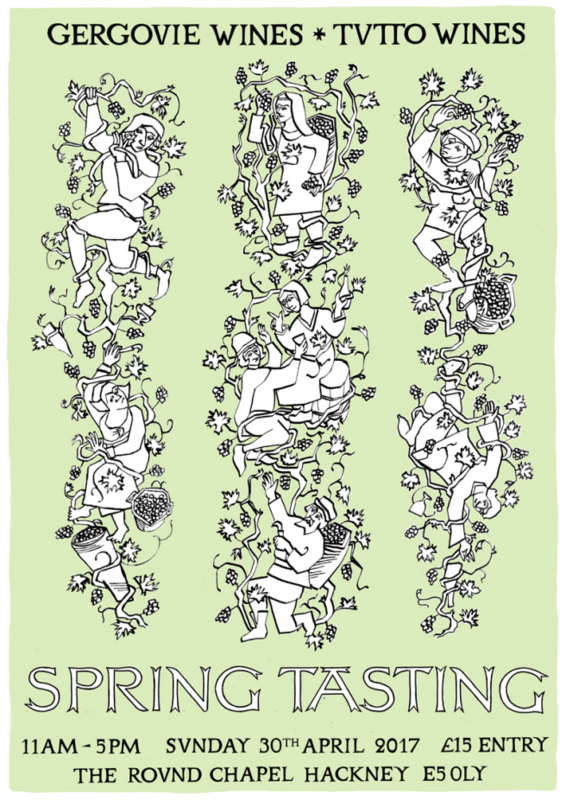 This Sunday April 30th we are joining our friends Gergovie Wines to host this year’s Spring Tasting. 3. The tasting will run from 11am until 5pm, with last entry at 4pm. We strongly recommend that you arrive as early as possible to avoid having to queue. We were extremely busy last year and as licensing restricts the number of people who can be in the chapel at any one time, sadly some people didn’t make it in. Come early to avoid disappointment. 4. Tickets are £15 on the door. You can pay by cash or card. This buys you a tasting glass which you can take home and the opportunity to taste with an amazing group of growers all day long. 6. Steve and the guys from 40 Maltby Street will be making lunch, which you can wash it down with glass of beer from The Kernel or a glass of wine from one of the growers. 7. Harry & Anna have made a limited run of prints and t shirts which will be available on the day. – Just across the street, P.Franco will be pouring wines from the growers by-the-glass and and serving bar snacks until late. They will also have plenty of wines from the fair available to take home. – Our friends at The Laughing Heart on Hackney Road are keeping their kitchen open until 1am serving an a la carte menu of Chinese food. You can drink from their epic wine list until 2am. – If you feel like dancing, a combination of great wine and music can be found on the beautiful sound systems of Behind This Wall in Hackney and Brilliant Corners in Dalston. If you are just after the latter, join our friend Pascal’s party upstairs at The Haggerston.